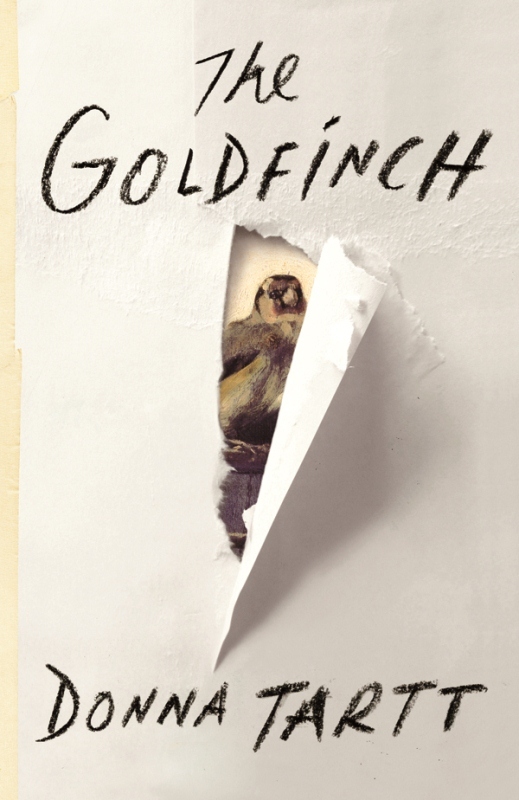 The Goldfinch by Donna Tartt opens, literally, with a bang. A bomb explodes at the Metropolitan Museum of Art in New York killing Theo's mother. In the carnage and smoke, 13-year-old Theo impulsively rescues her favorite painting. Theo becomes emotionally chained to his purloined Dutch masterpiece like the goldfinch is to its perch, unable to escape his dismal fate. The Goldfinch has been called Dickensian and the best literary novel of 2012, but the central art crime plot borrows more from Dan Brown and noir fiction. From Charles Dickens we get a lovable orphan sucked into a tough world of crime by larger than life characters. At 770 pages, Tartt's novel certainly has Dickensian heft. The slow 19th century pace, however, is oddly grafted to a page-turner final act. The art crime sections reminded me of The Da Vinci Code. There were shoot out scenes and genre gangsters, but Theo and Boris, his best friend and partner in crime, were well developed characters. "He was a planet without an atmosphere." "He seemed disconnected and partly elsewhere, like an adult in the room with small children." "Darkness. Under the foggy corona of the street lamps, park benches slick with rain, drip drip drip, trees sodden and black." "Down narrow streets we wandered, damp alleys too narrow for cars, foggy little ochreous shops filled with old prints and dusty porcelains. Canal footbridge: brown water, lonely brown duck. Plastic cup half-submerged and bobbing." There were marvelous, well-researched passages on art and antique furniture restoration but also a bit too much information on how to be an addict and still function. Theo's inebriated teen years in Las Vegas were like the camping scenes in the last Harry Potter: bleak and repetitive. The book could have been condensed by 100 pages. Although the first half of the book follows Theo from ages 13 to 15, The Goldfinch is not a young adult novel. Teen alcoholism, prescription drug abuse, shop lifting, child abuse, neglect and malnutrition seem only to build character with few consequences or mental impairments. Bad choices lead to worse choices. The Goldfinch is disturbing, but it makes you think. As soon as I finished, I flipped back to reread the finale. Everything came together so well, without too much resolution. Finally we got the introspection and learning missing from the earlier chapters. Although I was gripped by the narrative, The Goldfinch isn't a book I'd recommend to everyone, especially impressionable young readers. I preferred Tartt's debut novel, A Secret History, which had tighter writing and wasn't so relentlessly dark. Her engaging books are well worth reading for their wonderful characters, evocative atmospheres and intellectual depth. The Goldfinch has been on the NYT bestseller list since its October release and is a big hit in the Netherlands too. If you've read it, I'd love to hear your reaction. Reviewer's Disclosure: I bought a hardcover copy from Gulf of Maine Books without compensation. It was too heavy for travel so I also bought the ebook to finish in England. 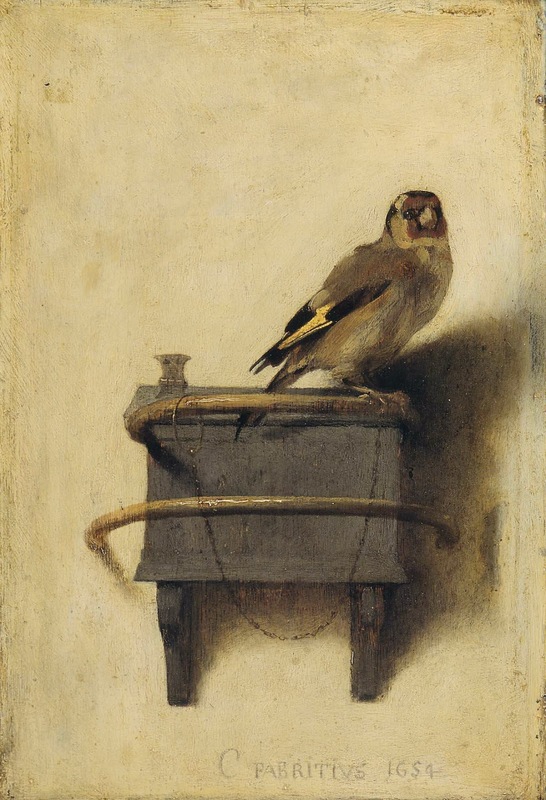 By coincidence, an exhibit of Dutch masters at the Frick, including the Goldfinch, opened on the book's release date and is up until January 19, 2014. I tried to see it when I was last in NYC, but the lines were too long. I'm so glad you reviewed this book, Sarah! It keeps popping up on recommended booklists whenever I'm searching for a new book. Sounds intriguing, especially your comparison to Dan Brown's books. I will probably read it at some point, though the darkness and the Dickensian atmosphere may put me off right now. I just finished "The Book Thief" last week and have vowed to read some lighter fare for awhile. It's next on the tbr. Thank you for such an in-depth review. I'm thinking I should probably start with A Secret History. I'm not sure I have the time or focus for an almost 800-page novel. Happy New Year! I love the sound of this book. Unfortunately, I tend to put really long books at the very end of the TBR pile. I always think, "I could read this. Or I could read these three other books." Still it sounds great, and what better time to read a long book than winter? Excellent review. You make good points. The quotes are wonderful. How is your Maine weather? It's been terrible here in Ontario. Rose and Pamela, this does seem like your type of book if you can get past the drug abuse. Patti, I’d love to hear your reaction. Barrie, you would prefer The Secret History, which is *only* 524 pages. Thanks for hosting and Happy New Year! Lucy and Stacy, I usually prefer books under 500 pages. Long ones are hard to hold and take time away from other books. Nonetheless, one of my favorite books was 1,400 pages: The Suitable Boy by Vikram Seth. Petra, sorry, I can see how that sentence would be confusing without seeing the painting first. Your facility with a second language never ceases to impress me. Jenn, we use an in house kennel run by a Native American on an island, where Scout enjoys playing with other dogs and a kitten. It’s been bitter cold sub zero weather in Maine too. Then it warmed up, rained and refroze, ruining the skiing. I’m hoping for more snow. Stay warm! All, I'm going offline to write my WIP. I'm a bit behind on blog visits, but I'll catch up on the weekend. Thanks for this thoughtful review. I've not read Tartt and appreciating the heads up that I start reading her with The Secret History. Heard lots about this book and almost, ALMOST! bought it a few weeks ago in Brick Lane. The only reason I didn't is that I have spent quite a lot of money on new records and want to save some for Atwood's trilogy, now that the last book's finally come out. There was a very good essay on Tart recently in the London Review of Books which prompted to grab thte book off the shelf in theat bookshop on Brick Lane. But not yet. I shall wait. Great review. By the looks of it she is a good observer: "He seemed disconnected and partly elsewhere, like an adult in the room with small children." That's a very good sentence.